Happy Bloggers Challenge Friday! This weeks Bloggers Challenge is a color challenge - use Black, White and any one color of your choice. I'm multi tasking again this week so I've combined Mercy's Tuesday Sketch for my layout, and as you can see I haven't had a chance to clean up my studio from my creating with the colors from The Play Date Cafe Challenge, so I just incorporated them into today's card, good thing it was Color Splash week! The beautiful papers are from the Basic Grey Scarlett Letter collection, I lightly spritzed them with the NEW Ranger Perfect Pearls in Kiwi, another reason why I pulled in the Green. The Pear panels are embossed with Texture Fades folders, lightly misted with Kiwi Perfect Pearls and highlighted with Crushed Olive Distress Inks. The flower is created with the Tattered Florals Die. Looking for more inspiration, click on the Bloggers Challenge Logo on my sidebar to see what the other players created this week. If you use Black/White/Green in your creation, be sure to enter the Play Date Cafe Challenge for a chance to win some beautiful stamps from Memory Box. Lisa this is stunning!!! You're amazing three challenges and one card! Don't know how you found the time with the CHA Convention! GREAT card, I really like the center of the flower! 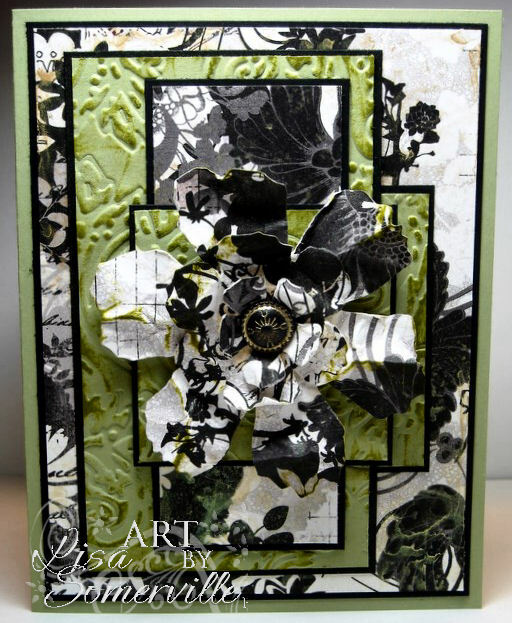 STUNNING CREATION - love those papers and all of the elements, Lisa! Looking forward to seeing you today! This is so dramatic Lisa! Love your layout and the flower is awesome! Have a great weekend! Really pretty. I like the light green with the black and white. It goes great and all those extras make this a special card. Wow! What a great Shabby Chic card. That flower is fantastic. OH MY! This is another beautiful card created by you!! LOOOOOOOOVE it! I love green--so this card is FABBY! I just love all the details--the flower is fab too! And three challenges;) WOOOOOOOOW~ you ROCK! Love it!!! WOW, the pop of green is Amazing! TFS!! This is fabulous, Lisa....so beautiful! Wowza! This is gorgeous! That flower!! Wowza! Simply a WOW card!! Love all the elements (and challenges) you pulled together!! You are a master at that!! What a stunning card! Great combination of all the elements, and love the green touch! Beautiful work of art Lisa! Love all the texture that you gave this card. Oh my goodness!!! The layers and the color and the texture make this one fabulous card!!! The flower totally pops right out!! A great card with some fabulous papers! Hope you had a great time at CHA. Fabulous card! 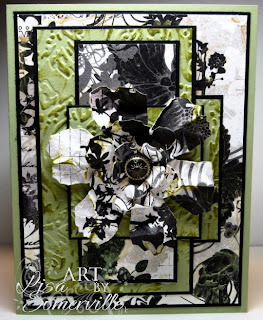 Love the flower and all the layers of embossing, color and stamping is fantastic! This is phenomenal, I love how it looks with the papers and that flower is super cool!!! WOW! Stunning! Love all the texture and layering....great card! your card is amazing! this flower is just gorgeous! LISA--You did a really wonderful job on your card. Love the green you chose. Great paper too. As others have said--it's Stunning! I love the way you layered the images and the paper. What a beautiful card!